THE WATSON FOUNDATION IN TUNE WITH PIPES AND DRUMS! THE Watson Foundation is pleased to be supporting The Govan Schools’ Pipes and Drums Association in Glasgow. The inspiring organisation has been giving free pipes and drums tuition to school pupils in Govan since 2014. Now the Foundation has given the GSPDA money to make sure they have the best equipment and to ensure it helps as many youngsters as possible. Pipe bans give young people skills for life, promote teamwork, self esteem, fun and friendship – vital things in an area like Govan where there is a significant challenge to defeat poverty. 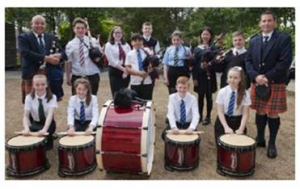 *The Band will be competing in the “Juvenile Novice” category of the World Pipe Band Championship at Glasgow Green on 13th August as a result of the financial sponsorship from The Watson Foundation.